Cigna Dental. Read more about Cigna Dental . A Cigna dental Review, Cigna dental Prices, Cigna dental providers. The web server with the IP-address 23.229.141.54 used by Cignadental.net is owned by GoDaddy.com, LLC and is located in Scottsdale, USA. The website Cignadental.net has a own web server. The web server only runs this website. 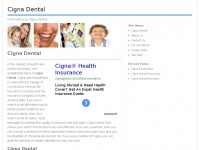 The websites of Cignadental.net are hosted by a Apache server and were developed in the programming language PHP. The content management system WordPress is used. The markup language of the website is XHTML 1.0 Transitional. The visitor analysis software Google Analytics is used to analyze the visitors of the websites. The website does not specify details about the inclusion of its content in search engines. For this reason the content will be included by search engines. In order to display ads the Google Adsense advertising network is used.